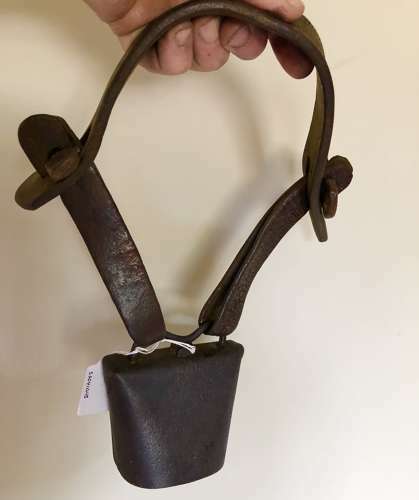 Original 19th Cent Shepherd's Clucket Bell on original leather straps, 2 ply leather yoke with carved (pegs) Lockyers. The bell has the typical English 'M' fixing and original clapper. It has had plenty of past use. This bell is just over 5.5 inches at it's widest point and came from the West Country. These bells were originally coasted in brass to improve their resonance but this wore off quickly rubbing agaist the sheep and being outside. There is however evidence of brass still in places. The crook, bell and lantern belonged to the shepherd whereas the sheep belonged to the Master. The yoke etc would have been hand carved by the shepherd. This style of 'Clucket' bell was typically used in the south from West Country up to East Anglia etc.